This below letter, written in partnership by the Downtown Seattle Association, Visit Seattle, the Alliance for Pioneer Square and the Seattle Hotel Association, came out last week. 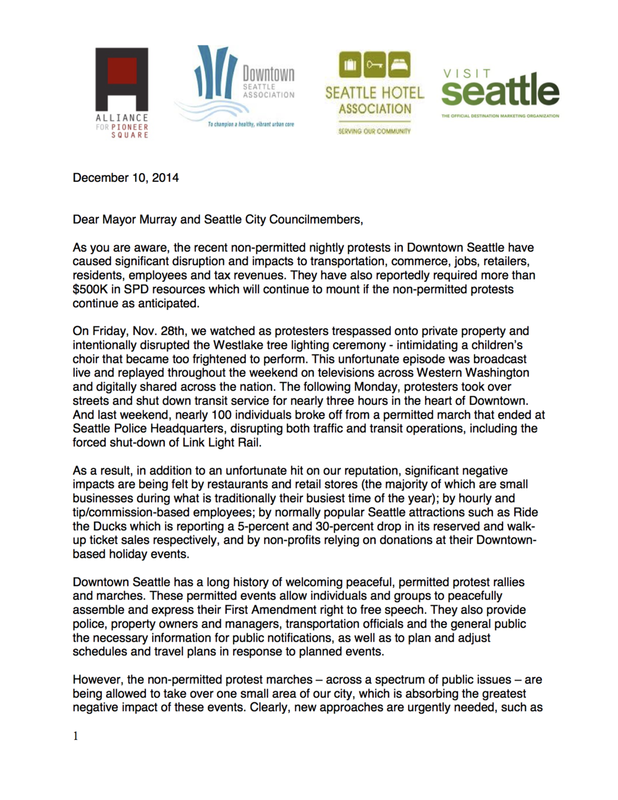 It was sent to Mayor Murray, but also sent across multiple email chains, which is how it ended up in my inbox. First, the letter. This is only the first page, but you can view the entire thing here. When I first read this, I thought about difficult it would be to limit protests to only those that are permitted, especially if the permit process takes a long time. The nature of protests is that they are an emotional response and thus are spontaneous. Then I started thinking about how it's always so interesting to view a situation from different perspective. As a brick and mortar business owner, I've been fascinated by the study of gentrification in Pioneer Square. What I've learned is that as a business owner, when you're faced with issues that deter customers (like feces on the side of your business, unsafe conditions for your customers, or in this case, unpermitted protests), it becomes difficult to think fairly when you literally see your business disappearing in front of your eyes. When small business owners are faced with problems like these and no outlet or information even for how to combat these issues in an easy, sustainable way, it becomes very clear to me why gentrification can happen so easily - small business owners often drive it because they are trying to support their livelihoods. This is very clearly NOT GOOD. In Pioneer Square, we have taken action to make information on how small business owners can access each component of a very complex public system (i.e. SPD, the MID, Cleanscapes, etc) very easily accessible, so they don't feel they are alone. It's been amazing to see the results of this work - owners are more interested in cooperating with local social services and making PSQ a livable, friendly place for everyone. Information can be very empowering. I simply see this letter as one part in a very complex equation as we work together to build a solution. Small business owners aren't often highlighted when discussing activism and its merits, but if they are a critical component of our economy, then their safety and ideas need to be taken into consideration as well.